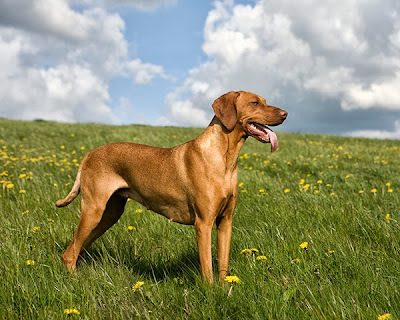 The Viszla is a dog breed originating in Hungary, known for being athletic and loyal companions. This is a natural hunter equipped with an excellent nose and outstanding trainability. They are lively, gentle mannered, and affectionate, but also fearless and protective when need be. Some people call them "velcro dogs" because of their loyalty and affection. Viszlas are often vocal. They sing along with the radio, and cry when they feel neglected. Are you sure that's a Vizsla and not a Ridgeback? The photo comes from a stock photo site, and the photographer claims that it's a Vizsla. That said, I haven't met the dog, can't really see on the photo if it has a ridge... Could be.